Aprende sobre los tipos de pescados y mariscos capturados en la Ria de Vigo y otros productos locales. Prueba los mejores vinos y platos gallegos. 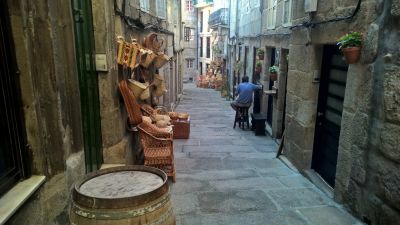 Entre paradas de tapas, tu guía te contará cómo es vivir en Vigo. Aprende sobre los diferentes vinos de Galicia, como Albariño, Ribeiro y Mencía. Myself 3 friends were met by our guide Sean just outside the cruise terminal which was the perfect start to only what we can describe as a fantastic tour. The tour included a walk round the town with Sean a very friendly excellent guide pointing out all the places of interest and giving full informative details. I must mention that two of our party are not red wine or seafood lovers but this tour is far more than wine tapas. It delivered on every front and a water or coffee was offered instead of wine if preferred. If ever we found ourselves in this region again we would not hesitate to take this tour again. 10 out of 10 we all had a Great Time.